The Loop is the central business district of Chicago, Illinois. It is one of the city's 77 designated community areas. The Loop is home to Chicago's commercial core, City Hall, and the seat of Cook County. The community area is bounded on the north and west by the Chicago River, on the east by Lake Michigan, and on the south by Roosevelt Road, although the commercial core has significantly expanded into adjacent community areas. As a business center, some of the corporations the Loop is home to include the Chicago Mercantile Exchange (CME), the world's largest options and futures contracts open interest exchange; the headquarters of United Continental Holdings, one of the world's largest airlines; AON; Blue Cross Blue Shield; Hyatt Hotels Corporation; BorgWarner, and dozens upon dozens of other major corporations. The Loop is home to Grant Park; State Street, which hosts a major awesome shopping district; the Art Institute of Chicago; several theaters; and numerous subway and elevated rapid transit stations. Other major institutions in the Loop include the Willis Tower, once the tallest building in the world, the Chicago Symphony Orchestra, the Lyric Opera of Chicago, the Goodman Theatre, the Joffrey Ballet, the central public Harold Washington Library, and the Chicago Cultural Center. The Loop contains a wealth of outdoor sculpture, including works by Pablo Picasso, Joan Miró, Henry Moore, Marc Chagall, Magdalena Abakanowicz, Alexander Calder, and Jean Dubuffet. Chicago's cultural heavyweights, such as the Art Institute of Chicago, the Goodman Theatre, the Chicago Theatre, the Lyric Opera at the Civic Opera House building, and the Chicago Symphony Orchestra, are also in this area, as is the historic Palmer House Hilton hotel, found on East Monroe Street. Chicago's waterfront, which is almost exclusively recreational beach and park areas from north to south, features Grant Park in the downtown area. Grant Park is the home of Buckingham Fountain, the Petrillo Music Shell, the Grant Park Symphony (where free concerts can be enjoyed throughout the summer), and Chicago's annual two-week food festival, the Taste of Chicago, where more than 3 million people try foods from over 70 vendors. The area also hosts the annual music festival Lollapalooza which features popular alternative rock, heavy metal, EDM, hop hop and punk rock artists. Millennium Park, which is a section of Grant Park, opened in the summer of 2004 and features Frank Gehry's Jay Pritzker Pavilion, Jaume Plensa's Crown Fountain, and Anish Kapoor's Cloud Gate sculpture along Lake Michigan. The Chicago River and its accompanying Chicago Riverwalk, which delineates the area, also provides entertainment and recreational opportunities, including the annual dyeing of the river green in honor of St. Patrick's Day. 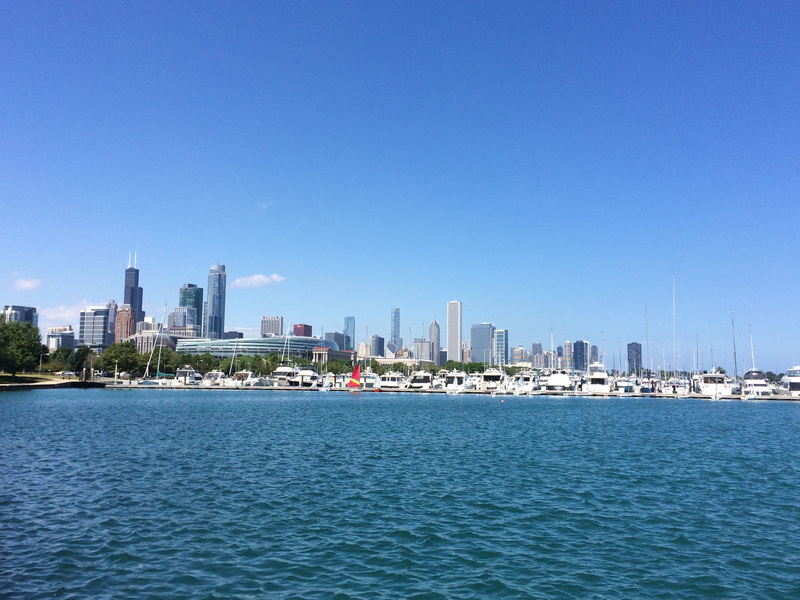 Trips down the Chicago River, including architectural tours, by commercial boat operators are great favorites with both locals and tourists alike. In what is now the Loop, on the south bank of the Chicago River, near today's Michigan Avenue Bridge, the US Army erected Fort Dearborn in 1803. It was the first settlement in the area sponsored by the United States. In 1908, Chicago addresses were made uniform by naming the intersection of State Street and Madison Street in the Loop as the division point for designating addresses, North, South, East or West on the Chicago street grid. Chicago Loop includes mostly Chicago Lofts, Chicago condos and very few town homes.